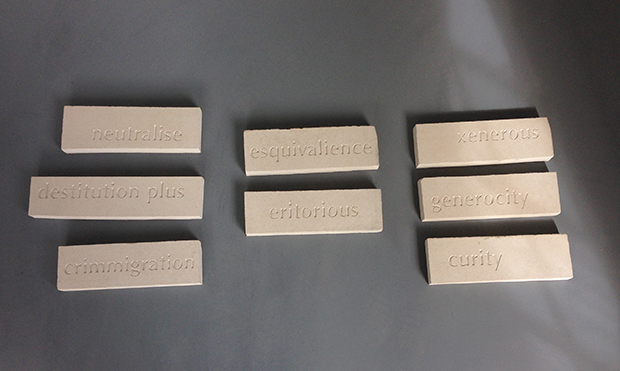 Inspired by Stephen Collis' project to create resister language we set about researching recent British government neologisms for categories of immigration and governmental response. We worked to replace these with our own lexicon of welcome. Anyone can invent new words and new words can help create new lines of thought and new social realities. Many people collaborated on this projecct. Thank you in particular to Mary Atkinson, Geoff Ship, Eley Williams and Daphne Wood for contributing words and to Pippa Westoby for carving the words into stone. This is an ongoing project. If you'd like to take part please get in touch.